GET Your ESA letter Today! If for any reason you change your mind on our ESA service, just request for a full refund. Our doctors cover 7 days a week. Electronic PDF is accessible on our HIPPA compliant server for easy access. No more airline or housing pet fees or restrictions. Lock your animal in from breed and other restrictions. 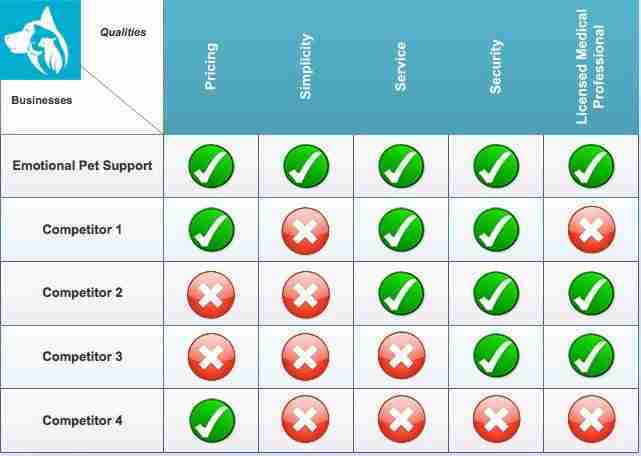 The only valid ESA company with verifiable reviews. Our mental health professionals are here to help you keep your animal with you at all times. Fill out the brief online questionnaire by navigating down the page to the exam section. 100% refundable if not satisfied. An assigned doctor will review your exam to determine if you are in need of an emotional support animal or animals. A secure link is emailed to you allowing access to download all ESA documentation in PDF format. Optional: Hardcopy and other options are available. Optional ESA Telehealth doctors for those in need of ongoing therapy. You do NOT require ongoing treatment to get an ESA letter but we do offer additional services should you need such. Our service is only for those that are in need of a doctor's ESA prescription letter. The ESA (Emotional Support Animal) letter allows a person with one to three animals live in their home without paying pet fees or worry about a breed restriction. Also, you can fly in the cabin of any airplane at no charge. The exam below will be reviewed by a mental health professional or medical doctor within 12 hours via tele medicine or tele psychology. Note: We no longer support College/University living on any campus or dormitory property. You are not required to own your animal prior to getting an ESA letter. Revising your ESA letter is free which helps those that wish to make sure that their landlord pre-approves. Beginning in 2018, airlines such as American, United, Delta, Alaska, JetBlue, Spirit, Frontier, Allegiant, Hawaiian, and several other international airlines, require additional documentation for customers traveling with an emotional support animal (ESA). Currently, customers must provide a recommended 48 hours notice to the Accessibility Desk. Customers will need to also provide a veterinary health form documenting the health and vaccination records for the animal as well as confirming that the animal has appropriate behavioral training. Note: Patients that are minors (under 18 yrs. old). We recommend that the parent or legal guardian complete the exam with their name as the patient instead of the minor’s name. Many landlords take issue to a name that is not on the lease. Some airlines might require additional information which will slow down the process. The adult can mention within the stress input form section the appropriate indicators regarding the minor’s issues but as the point of view from the parent. We will text message you a confirmation of the order. You are not required to own your animal before applying for an ESA letter and can leave the weight, breed, and name fields blank till you get your animal. We can always update the letter later. Note: Please double check the spelling of your animal's breed and name as we will not. Commonly misspelled names: Shih Tzu, Shepherd, and Chihuahua. 1 to 10 lbs.11 to 20 lbs.21 to 30 lbs.31 to 40 lbs.41 to 50 lbs.51 to 60 lbs.61 to 70 lbs.71 to 90 lbs.91 to 120 lbs.> 120 lbs. The file uploader box will display below only if you select the ID card option. Email support@emotionalpetsupport.com anytime only if you don't have photo(s) of your animal at this time. Note: The hardcopy ESA letter is printed on special parchment 24 lb. weighted paper and should be purchased when traveling overseas or if your landlord requires such. The durable optional Photo ID card is made from the same material as your common credit card. Upload a Photo for each animal. Please allow time to upload your photo(s) before submitting the exam. Please write any additional comments or instructions within this box. Latest 2019 airline travel forms. Our general Air Travel ESA Letter works well with all airlines but If you're planning to fly on any of the above airlines, we recommend that you select the appropriate form option. You also can order any airline form in the future from the special service link that will be emailed to you.Note for DSM V (5), DSM IV (4), and earlier versions: Diagnostic and Statistical Manual of Mental Disorders, Fifth Edition covers all earlier editions IV (4) and earlier. Some airlines might reference the older version but will still accept the current DSM V(5) version. Please note that some pages require additional information. Optional service to use only if your landlord has their own form that needs to be filled out by our doctor (RAF: Reasonable Accommodation Form). You can always request this option in the future if you're not sure now. Reviewed 7 days a week / 365 days a year. From submission time to receiving the electronic PDF ESA letter. Note: Delays will occur if any suicide related questions are answered "yes" as the doctor is required to follow up with you. The plan above covers the doctor's assessment fees, prescription ESA letter, and verification. Note: The Apartment Housing letter works with all dwellings while the Air Travel letter is only good for flying with your animal in an airplane. By signing this form, the applicant is affirming or swearing that all information contained in the form is true and correct. Note: If you are unable to sign it now, we will follow up with you later. This option is very important: If you are moving to another state, please select that state otherwise select the correct state you live in. Our doctors utilize “Telehealth” (telemedicine/telepsychology) which is a collection of means or methods for enhancing health care, public health, and health education delivery and support using telecommunications technologies. Over the past 40 years, telemedicine has been used to bring healthcare services to patients in distant locations. 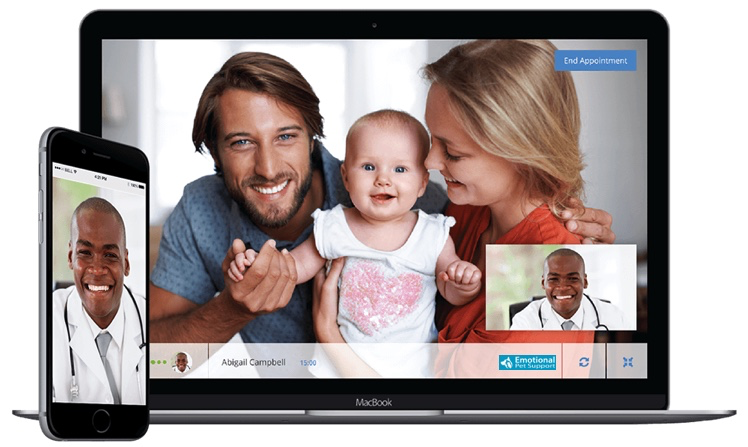 Not only does Telehealth improve access to patients but it also allows social workers, psychologists, and medical doctors to expand their reach, beyond their own offices. Ultimately, we came to the conclusion that lifting the veil of the Fair Housing act to educate the American people was not only necessary, but long overdue. At the end of the day, the best part about doing what we do – besides turning our passion into a business – is making rental living pet friendly. Sample ESA letter. Our doctors utilize “Telehealth” (telemedicine / telepsychology) which is a collection of means or methods for enhancing health care, public health, and health education delivery and support using telecommunications technologies. Over the past 40 years, telemedicine has been used to bring healthcare services to patients in distant locations. 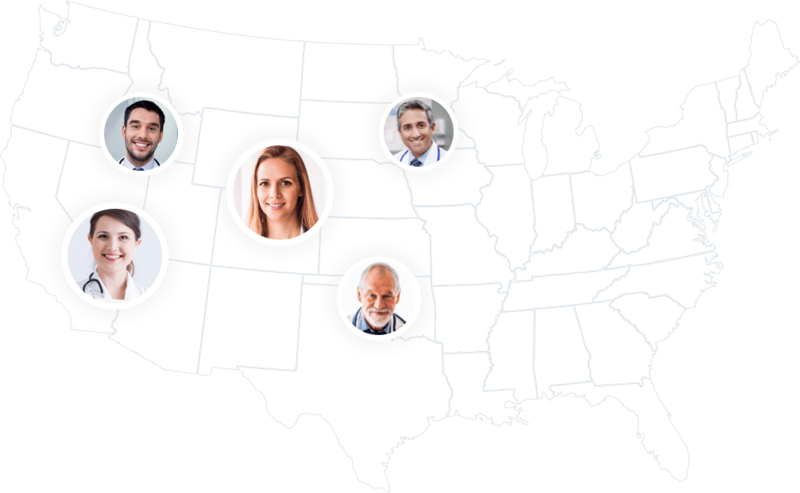 Not only does Telehealth improve access to patients but it also allows psychologists and physicians to expand their reach, beyond their own offices. We will connect you to a doctor via telehealth services that will review your exam and write your Emotional Support Animal prescription letter (Apartment rental and airline travel written separately). Your landlord and/or airline can verify the ESA Letter by contacting the doctor directly. Emotional Pet Support helps people with anxiety, depression, or chronic stress to connect with a mental health professional to get a recommendation for an emotional support animal (ESA). 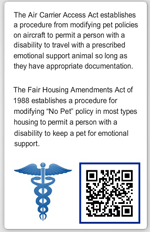 Emotional support animal prescription letters can help you bring your pet onto airplanes and into apartment complexes. Our exam was written by a mental health professional to help determine your need for an ESA Letter. We are dedicated in our quality of work within the field of emotional support animal services. The ESA prescription letter requires a real licensed mental health professional to approve and file ESAs accordingly. View a Sample ESA letter. Emotional Pet Support helps people with anxiety, depression, or chronic stress to connect with a mental health professional to get a recommendation for an emotional support animal (ESA). 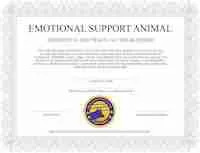 Emotional support animal prescription letters can help you bring your pet onto airplanes and into apartment complexes. Our exam was written by a doctor to help determine your need for an ESA Letter. We are dedicated in our quality of work within the field of emotional support animal services. The ESA prescription letter requires a real licensed doctor to approve and file ESAs accordingly. All types of domesticated animals can be Emotional Support Animals (cats, dog, and birds) and they can be any age (young puppies and kittens, too!). These animals do not need any specific task-training because their very presence mitigates the symptoms associated with a person’s psychological/emotional disability, unlike a working service dog. The only requirement is that the animal is manageable in public and does not create a nuisance in or around the home setting. In addition, the letter must be dated, written on his/her letterhead, include his/her license type, number, date of license, and state in which the license was issued. View a Sample ESA letter. Remember that we at Emotional Pet Support can help prescribe such a letter and you can begin by taking our 10-minute exam. Believe it or not, Emotional Support Animals have been legally recognized by the US government since the late 1980′s. Up until recently, ESA’s have been flying under the radar due to a lack of knowledge of the Fair Housing Amendment Act. Over the last four years, the media has really put ESA’s in the National spotlight with many articles educating people on the merits of ESA’s. emotionalpetsupport.com is the first mainstream service in the history of the United States to provide Emotional Support evaluation to the general public. With a countless number of satisfied ESA owners, Emotional Pet Support is now growing to be a nationally recognized brand. Who will conduct my disability determination? 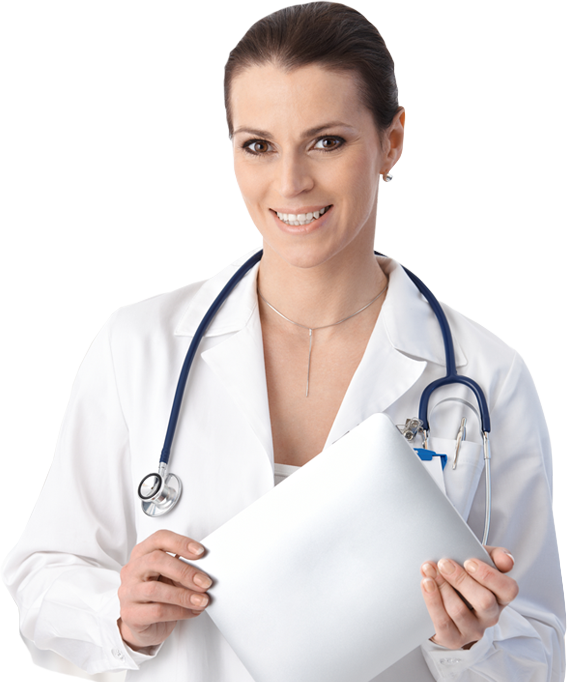 We contract with a team of mental health professionals who are licensed in multiple states. All of our consultants are active clinicians with established practices conducting mental health assessment, treatment, and disability determination. Before the Americans with Disabilities Act of 1990 (ADA) was implemented, the protections offered for individuals utilizing animals for medical and emotional support were limited. Under Title II of the ADA, individuals with ESAs must have a reasonable accommodation for their animal as an assistive aid. Since that time, the provisions have been modified, providing a greater scope of protection for service animals (SAs) and emotional support animals (ESAs), as well as the individuals who own them or utilize their services. However, it is very important to understand that ESAs are not permitted to be in as many places as service animals. Have general questions, want to be an affiliate, or wish to join our team social workers, psychologists, and medical doctors? Don't be shy and send us a message. Therapy animals: These animals are usually evaluated and registered by an agency and provide emotional support to individuals who need them. They are often used in hospitals, nursing homes and in school reading programs such as Reading Educational Assistance Dogs. Service animals: These animals have been specially trained to perform tasks their owner can’t do on his or her own. Guide dogs for the blind are perhaps the most well known in this category. Service animals are not required by law to wear vests or have any form of identification. Eighteen states, including Virginia, Colorado, Texas, Florida, and California, have laws that criminalize fraudulent representation of a service animal. These violations are usually misdemeanors, but repeated violations can result in jail time. West Virginia is not one of the 18 states, however, businesses could pursue a trespassing charge if a second incident occurs. Play it safe with an ESA! 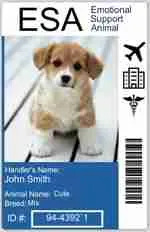 The doctor’s ESA letter lists the species, breed, weight, and name on the emotional support animal letter. Emotional support dogs and emotional support cats are allowed to fly onboard an airplane while most other species can only become a dwelling / housing ESA. The ESA letter provides protection under federal law for those that benefit from having an ESA. Your assigned doctor will prescribe a legitimate ESA letter on their letterhead. The letter can have up to three animals listed as emotional support animals under one individual name for each emotional support letter. The price is the same for an emotional support dog letter, emotional support cat letter, or any type of animal.